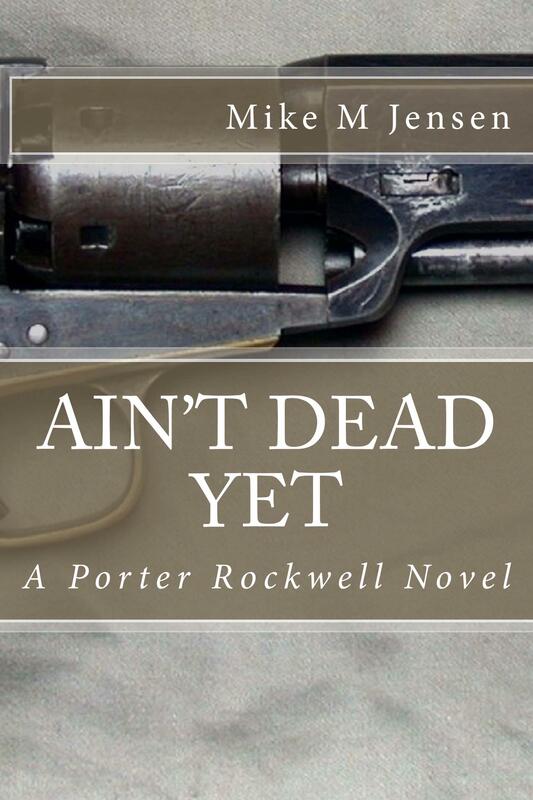 Ain’t Dead Yet is a novel based on the real person of Orrin Porter Rockwell. Better known as Porter, Rockwell holds the curiosity, admiration and sometimes even the shame of millions of LDS people. His grave site, more than a century after his death in 1878, remains one of the most visited grave sites in Salt Lake City, surpassing and rivaling Mormon Church leaders. He stands as an early pillar of the fledgling faith yet he became known for his swearing, drinking, and readiness to “use a man up”. Feared by visitors and loved by the citizenry, Rockwell is the beloved and hated Bad Boy of Mormon and Intermountain West history. Extensive and successful works have been written to document Rockwell’s life, some fictionalized. However, author Mike M Jensen believed there remained more to be said of how Porter thought, what he felt, and more of the man behind the history. He chose to place the real man, as he understood him from his own reading, into a fictionalized story and then ride along, exploring and showcasing the character within. The result is Ain’t Dead Yet. The story swirls around the promise made to Rockwell by Joseph Smith, the founder of the Mormon Church. Smith stated that so long as Rockwell never cut his hair, he would never be killed by blade or bullet. Rockwell ceased to cut his hair and the knowledge of the promise spread through the years to the point that many believed he might never die and others wished to challenge the veracity of such a claim. How does one deal with such a declaration? How much stock can one put into such a belief when one’s own life is the proof? What if it becomes your job to put that life on the line? Only six characters in the story, Rockwell, his wife Mary Ann, Brigham Young, Frank Worrell, Sherriff Backenstos and Judge Drummond, retain their actual names. Many locations are real and some situations anchored in historical truth but the specific events are entirely fictional. Beginning with the first challenger of the “Promise” losing his bid, Rockwell becomes a target for family revenge and the center of the crazy political struggles of early Utah history. Along with negotiating as Deputy Marshall with the native Ute Indian tribe to stop problems between them and the early immigrant settlers, Rockwell finds himself on his own search for revenge when a neighbor is shot for information of Rockwell’s whereabouts. Before revenge can be attained by either party, hired bounty hunters draw Rockwell into a high mountain game of chase, filled with plenty of firepower and rugged chess-like strategy. Alternating loyalties, ruthless pursuit, prayerful moments, and numerous one liners, play out to a fight to the finish and final confrontation before Rockwell can return home. Length: Approximately 63, 000 words.